Olimp HMB Mega Caps is a dietary supplement containing hydroxymethylbutyrate, which is a metabolite of L-leucine. This product has strong anti-catabolic properties which help to keep muscle mass at the desired level. In addition, taking HMB has a positive effect on the body composition, because it promotes oxidation of fatty acids. Calcium β-Hydroxy-β-methylbutyrate is a source of hydroxymethyl butyrate (HMB) combined with calcium. HMB is a by-product of L-leucine metabolism, naturally occurring in the body and increasing effectively the rate of muscle protein synthesis (MPS). However, L-leucine obtained from food is transformed into HMB to a very low extent (approx. in 5%). As a derivative of L-leucine, HMB has strong properties preventing protein degradation in skeletal muscles. Hydroxymethylbutyrate intensifies the synthesis of cholesterol in cells, thanks to which it provides them with stability and constitutes a kind of protective barrier against the activity of proteolytic enzymes. Therefore, the preparation minimizes the risk of muscle loss, which can be exacerbated, for example, by stress, excessive physical exercise or insufficient supply of proteins and nutrients. Similarly to leucine, HMB activates mTOR kinase pathways, which is the major signalling pathway enhancing MPS. It is true that this compound shows a slightly weaker effect than leucine. Nevertheless, studies have shown that people supplementing HMB achieved much higher weight gain than those taking placebo. Interestingly, it has been shown in rodent studies that taking HMB may increase the effect of insulin-like growth factor (IGF-1), which also increases the rate of MPS. Although HMB supplementation enhances anabolic processes and may contribute to increased calorie intake (as it increases appetite), some studies have shown that HMB supports the reduction of body fat. This substance is said to increase fatty acid oxidation during exercise, which is combined with greater muscle mass and therefore affects the body composition positively. Taking HMB is associated with reduced muscle damage resulting from physical exercise. Few muscle injuries mean less muscle soreness, which is known to hinder everyday functioning. Thanks to this, HMB can shorten the recovery time between trainings, as well as improve the comfort of everyday functioning after intensive workouts. In many studies exploring anabolic properties of HMB researchers investigated also whether supplementation of this substance increases skeletal muscle strength. It has been proven that by taking HMB you can gain an extra few percent strength during resistance training, compared to the placebo group. Interestingly, by taking HMB along with ATP (adenosine triphosphate), participants acquired up to 3 times more strength than the control group. CaHMB is contained in MegaCaps capsules – a formula developed especially by Olimp, which makes it possible to enclose the maximum dose of active substance in one capsule. Thanks to this, taking the supplement is comfortable, there is no need to take a large number of capsules and strain the digestive system. 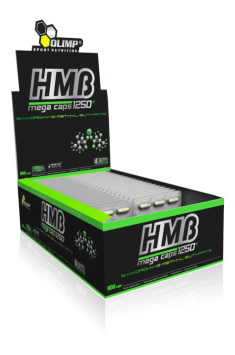 To sum up, Olimp HMB Mega Caps is a supplement containing calcium hydroxymethylbutyrate, without any unnecessary additives. HMB effectively prevents the breakdown of skeletal muscles and reduces damage caused by training. In addition, it has been proven that taking HMB increases both muscle mass and muscle strength, meanwhile supporting the reduction of body fat. The preparation may also help to decrease muscle soreness and increase appetite. Bulking agent - microcrystalline cellulose, anti-caking agent - magnesium stearate, capsule (gelatin - coat-holder, color: E 171).